Do you have a room that just doesn't seem to stay warm? Do areas of your house seem to be drafty? Do your heating and cooling expenses seem to be a little too much? At Mitchell AC & Heating, we specialize in maximizing the energy efficiency of your home. We have been installing insulation in the Palo Pinto, Parker and Young counties for over 10 years. In able for your home to stay comfortable, your heating system must replace the heat lost in the winter just as your air conditioner removes the heat gained in the summer. By insulating floors, walls, and ceilings you reduce this heat flow by providing an effective resistance to the flow of heat. At Mitchell AC & Heating, we only use insulation that meets the toughest indoor air quality standards in the industry. 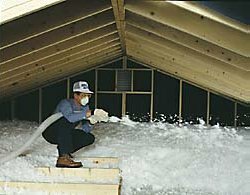 Mitchell AC & Heating now offers attic blown-in insulation services. 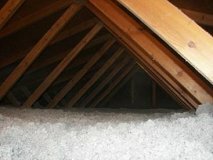 Conserve energy now by calling on one of our HVAC specialists to evaluate and improve your home's attic insulation. You are probably asking yourself, "Why?" "My home is already insulated. Why do I need more?" Below you will learn more about why and how replacing your home's insulation benefits you. Insulating your home saves money and our nation’s limited energy resources. Adding new insulation makes your home more comfortable by helping to maintain a uniform temperature throughout your home. Insulation makes walls, ceilings, and floors warmer in the winter and cooler in the summer. The amount of energy you conserve will depend on several factors: your local climate; the size, shape, and construction of your house; the living habits of your family; the type and efficiency of the heating and cooling systems; and the fuel you use. Energy conserved equals money saved and saving energy will be even more important as utility rates go up. Insulation acts as a sound barrier. Did you know that heating and cooling your home accounts for 50% to 70% of the energy used in the average home? Here's another fact... heat flows naturally from a warmer to a cooler space. During the winter months, the energy you use, heats your home, but then seeps into other areas such as your garage, basement, and even the outdoors. Who wants to heat space we are not using? Not only will insulation protect your family from the cold, it will improve the air quality in your home. Insulation can also act as a sound barrier. All this, while lowering your energy costs up to 40%! So, now you have made the decision to upgrade the insulation in your home. How do you choose an insulation product that is perfect for the needs of your home? The answer is actually quite simple. 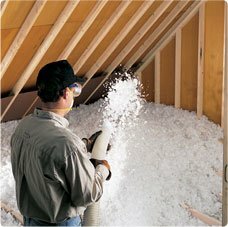 The greater the R-Value, the greater the efficiency of the insulation product. What is R-Value? Insulation is rated in terms of thermal resistance, referred to as an R-value, which indicates the resistance to heat flow. The higher the R-value, the greater the insulating effectiveness. As with any other product you are installing in your home, upgrading your homes' insulation is only as effective as the product itself if it is properly installed. As a customer of Mitchell AC & Heating you can have the peace of mind that you have made the right choice. We invite you also to continue your tour of our website. If you have any questions or we can assist you in anyway, please call Mitchell AC & Heating at 940-664-2228.